Advertisement is ideal for business promotion, carrying out research work and selling products or services of every enterprise. However, real estate marketing can be quite costly and competitive to carry out. 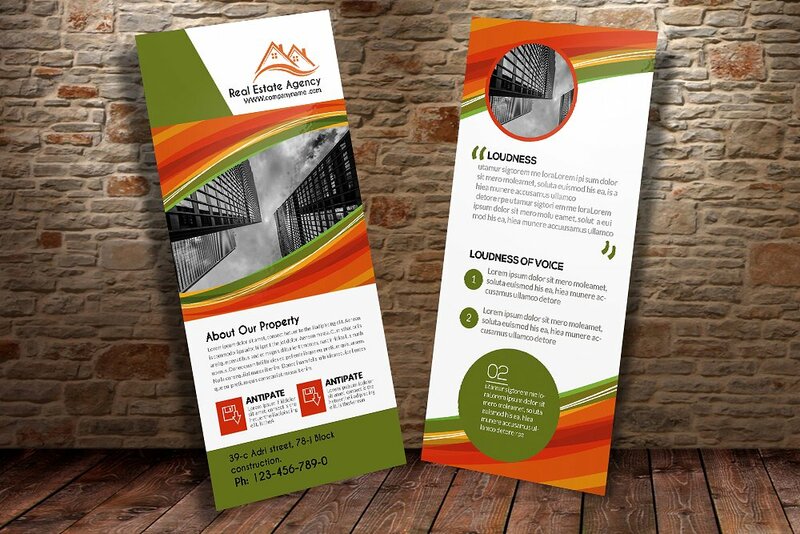 Use of rack card templates for marketing is cost effective since they are smaller in size compared to brochures and flyers. 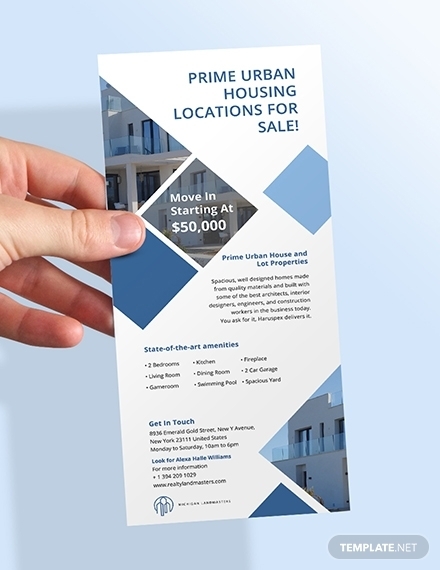 Rack cards are quite handy since they convey information at a glance in different areas. They make use of high resolutions graphics and slogans with straight-forward content. This delivers your message to your target audience without the need of using much content. 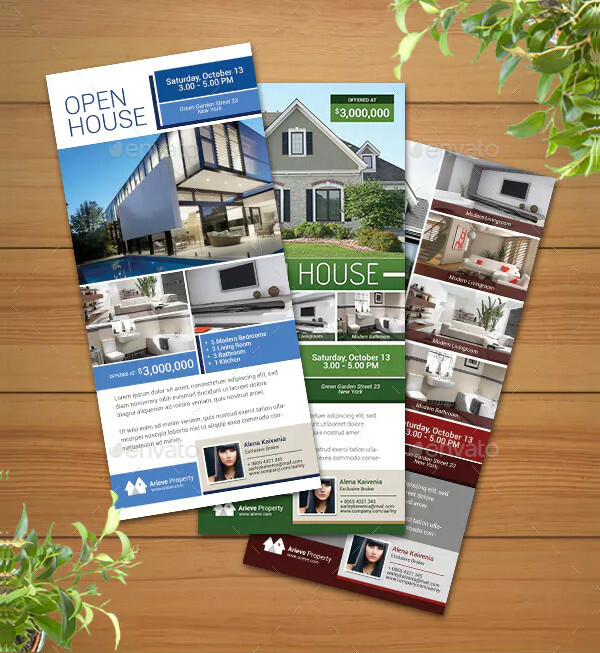 If you are in search of rack card templates for your business promotion, choose from the below samples what will fit best your real estate commercial. 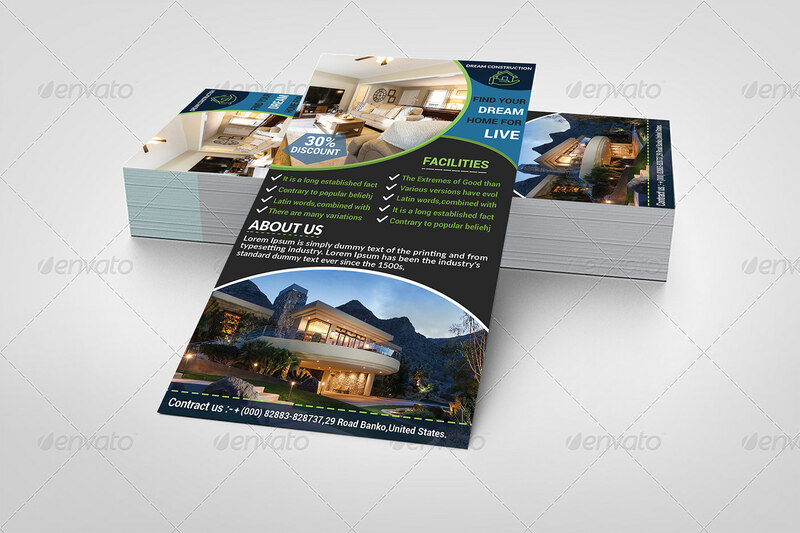 This rack card sample is professionally designed to stand out from other racks found in hotels, travel centers, waiting rooms and convenience stores. You can use this sample to showcase your best house sale offers increasing your chance of a quick sale. You can go deeper and explain the high class amenities you offer in your premises and how their architect design benefits your clients. Get this template in 4×9 inches size. Feel free to customize to your business taste. The business description you give to your clients determine the attitude your audience have about your business. 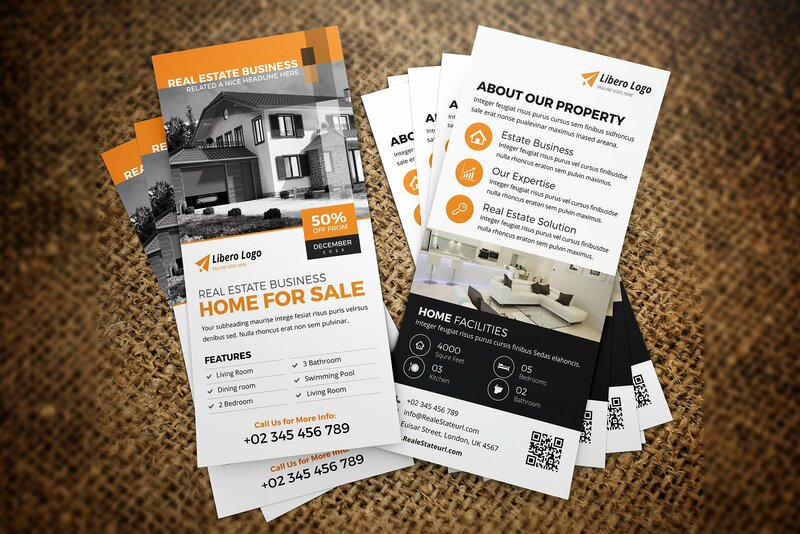 With this sample you can give a professional business description by use of a logo and a list of your lucrative products and services your real estate offers. You can also use high resolution graphics that will showcase your unique work to close more real estate deals. Get this template for free. 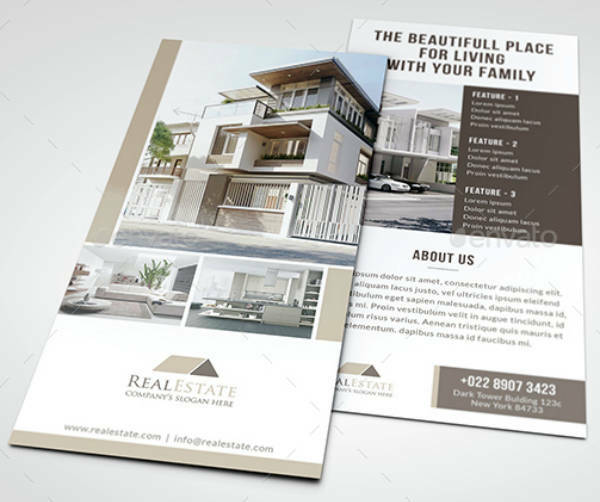 Are you in search of a professionally designed real estate rack card to promote your elegant houses? This sample has flash designed subtitles that can easily take the attention of new potential target audience. You can get this template in Illustrator, Publisher, InDesign, Photoshop, MS Word or Pages format and use it to build your business brand. An impressive professionally designed rack card is what you need to catch the eye of your target audience with one glance. 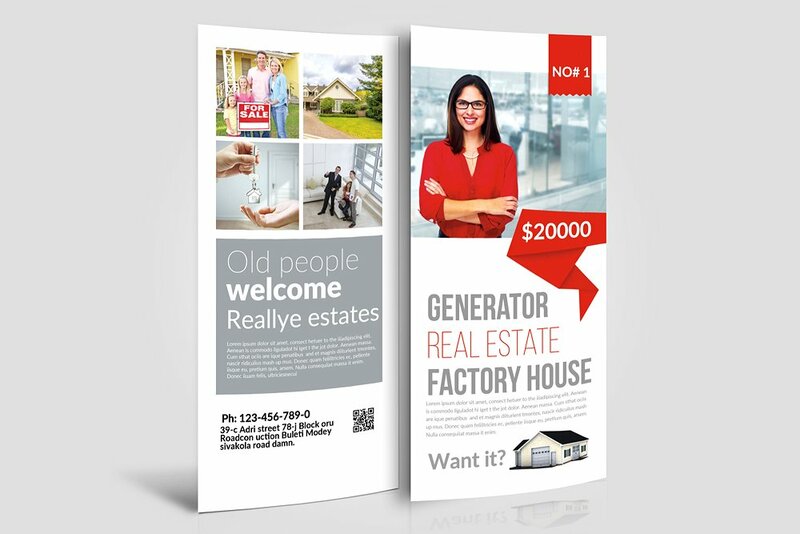 This sample has elegant designs to capture the various properties you are promoting. You can include a list of the amenities your real estate offers. Download this template at different file formats and sizes and personalize if necessary. Do you need to give a fresh look to your real estate sales adverts offers? You can advertise your great offers by use of quality previews of your work samples by photography. Take advantage of the highlighted colors to attract target audience to close more deals. You can also use these well ordered designed layouts and layouts groups that are easy to edit to your business style. 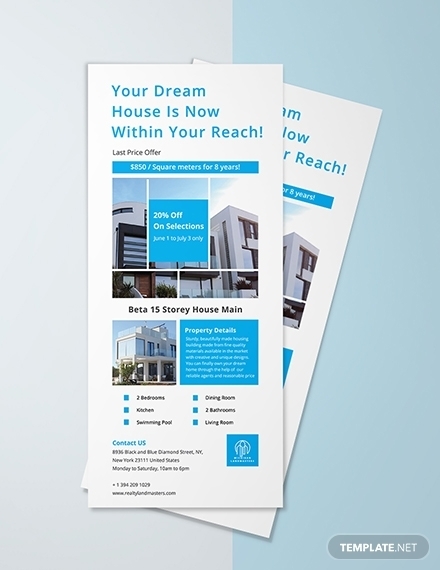 In case you want a quick response to your real estate enterprise prominent offers, check out this template. This template has outstanding layouts that makes your business stand out from the rest.Use this sample to save your time and money and build your brand awareness. You can access the sample in Illustrator, Publisher, InDesign, Photoshop, MS Word or Pages formats. Download at your preferred file size. This sample is professionally designed to advertise urban living properties. It can be used by real estate agents or realtors to showcase your home decors and properties. 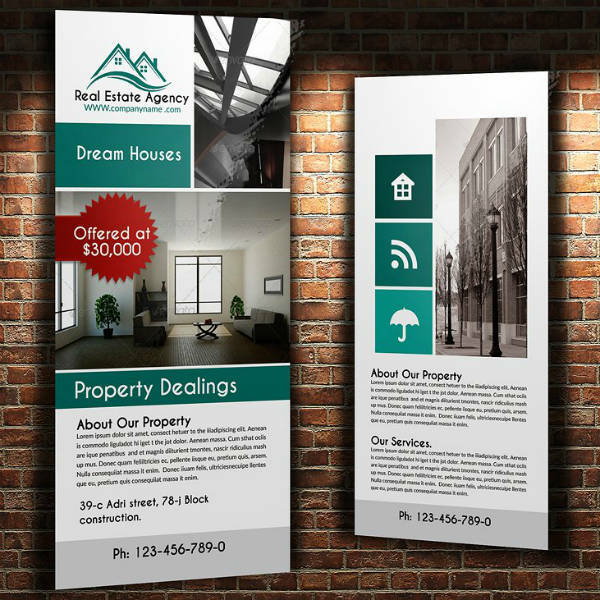 This stylish and modern sample is designed to express to your target audience what your business is up to date with in real estate. Click the download link to access the above template and customize it to suit your business style. 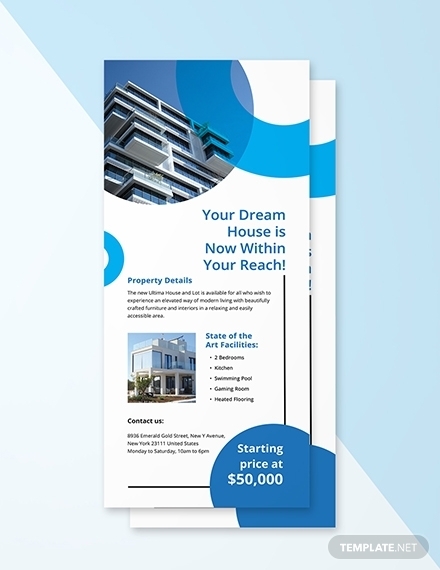 For any real estate business promoter, you need to get a professionally designed rack card. 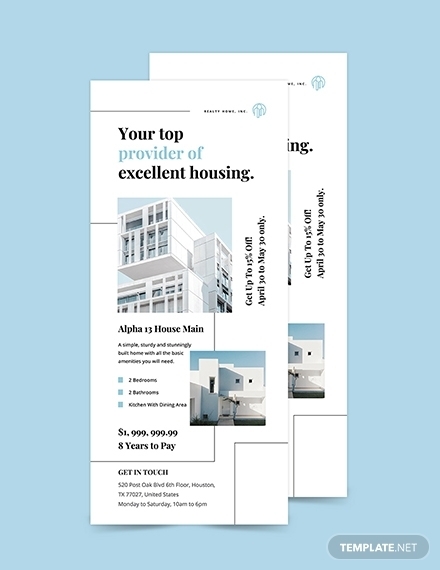 Your rack card should give a unique tone of the style of your business products. It should be indelible enough for new customers to take the cards for future reference. This sample has well organized easily editable layouts that give your potential clients the additional services and products your business offers. For anyone promoting property in an urban setups, this sample fits urban situated real estate commercials. It is spaciously designed to outline the listings of your business promotion. It allows you to include new content about your business or replace the existing one easily. It is available in Illustrator, Publisher, Photoshop, MS Word or Pages format and in various sizes depending on your preference. 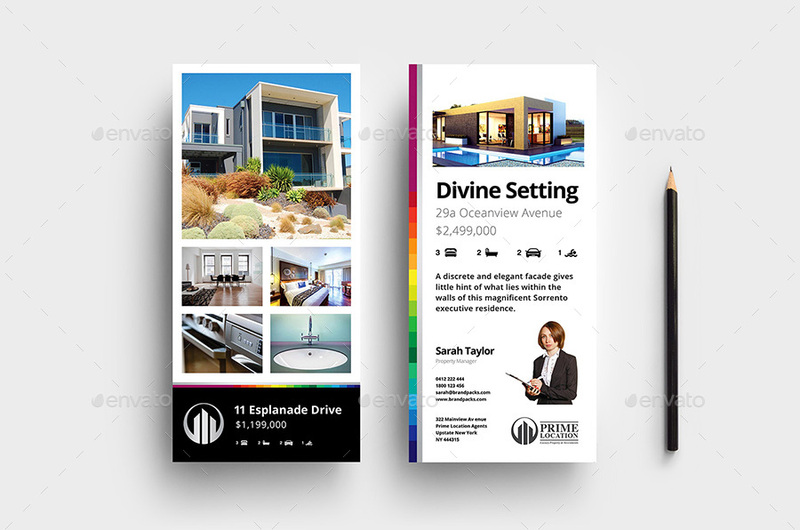 Anyone in need of a modern stylish design for their real estate corporate promotion, this rack card can work well for you. It has uniquely designed layouts to strategically place your business information. You can easily highlight the featured content by use of an incredible business color theme.This simplifies creating awareness for your business brand and offerings to your clients. This sample is available in 4×9 inches + bleed. Creativity in your business adverts is core to standout from your competitors. 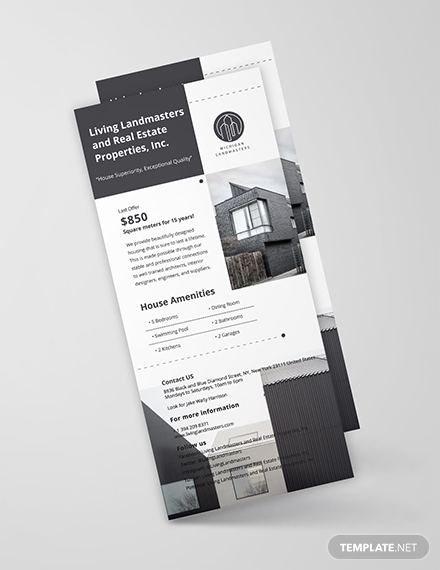 Make use of unique brand styles to leave a lasting impressions to your clients.This sample is perfect for any real estate advertisement agency. You can easily change the colors and graphics using the smart object feature. Download at your preferred file format and size. 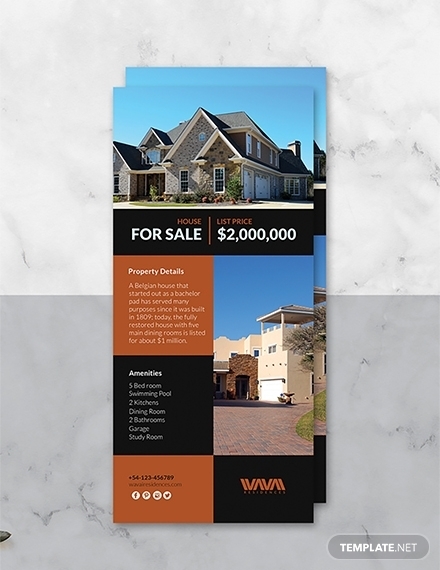 Are you looking for an appropriate rack card to promote your real estate home property? This sample gives you a guide on how to organize your profound services to your target clients. You can easily edit the order of the layouts and organize the rack card to fit your business style. You can also change the colors to match your business theme. Get this sample in Illustrator, InDesign, MS Word, Pages, Photoshop, Publisher formats and your preferred size. 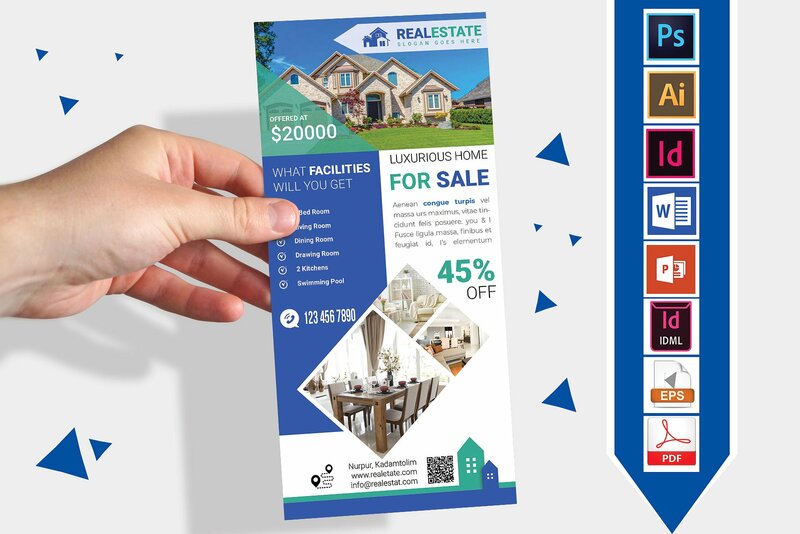 If you are in search of a professional rack card to promote your lucrative house properties, this will impress your clients. This sample has minimal content but great choice of artwork to attract new lucrative clients. Make use of the well ordered layouts that give focus to your offers. You can easily change the color scheme of the template and replace the images. Download the template at your preferred format and size. This template is suitable for a property owner or real estate agency who deal in leasing and selling luxury property in the urban areas. The template is easy to customize and fully editable. It supports different file formats and sizes.